This mahogany writing box from Dorney Court dates to the late 18th century. 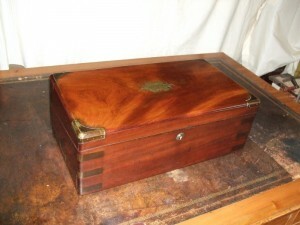 It has the name Charles Palmer engraved on the cartouche. The Palmer family have lived at Dorney Court since 1624. 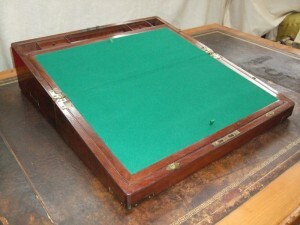 It may well have been owned by the rather notorious Charles Harcourt Palmer, who died in 1838, although the name Charles occurs frequently in later generations of Palmers. When it came onto the workshop, the polish on the outside of the box was badly marked and water-stained and the box was very dirty. The polish on the back of the box had completely degenerated. The top of the box was not attached, as the hinges were broken. The two interior writing surfaces on these boxes are held together by a strip of calico under the baize which is glued to each surface and acts as a hinge. This calico had disintegrated and the writing surfaces were barely held together by the very moth-eaten baize. This was the original baize, so it would have been nice to keep it, but in order to replace the calico hinge and get the box in working order, it had to be removed. 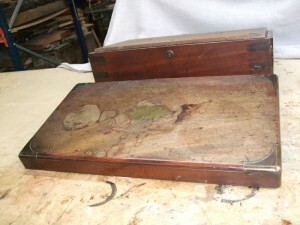 At the top of the writing slope are the compartments for keeping pens, quills etc.. 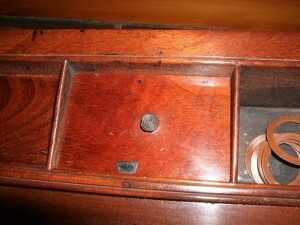 There are two lids, each with a tiny turned rosewood knob. 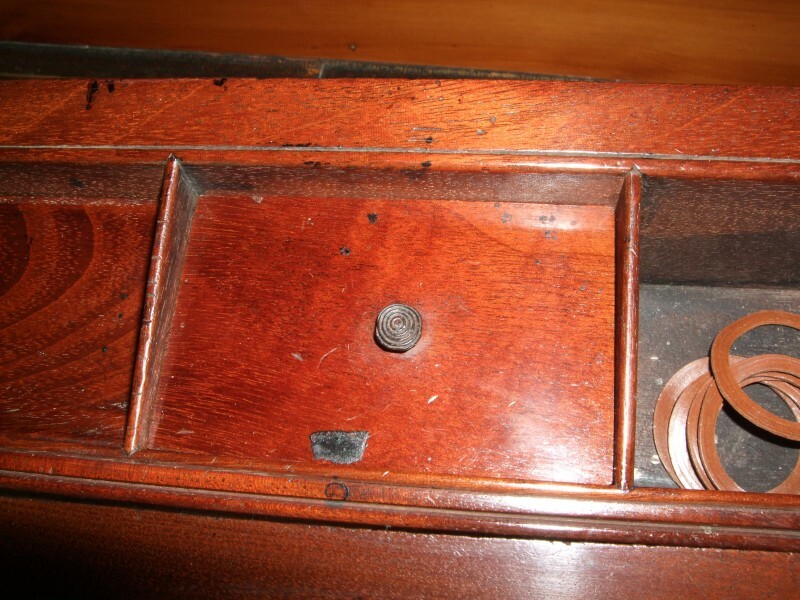 The diameter of each knob is 8mm and one of them had broken off and was missing. 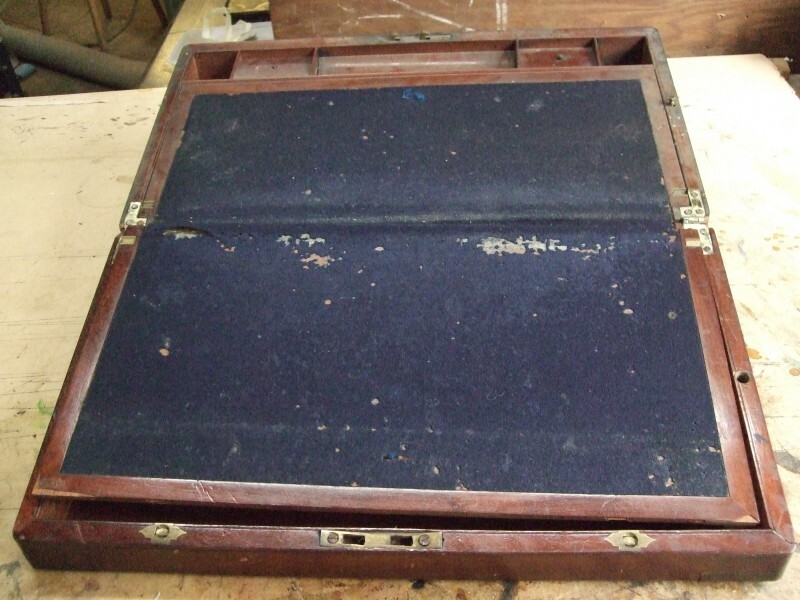 The box was cleaned, the broken hinges were brazed back together and the lid was re-fitted. 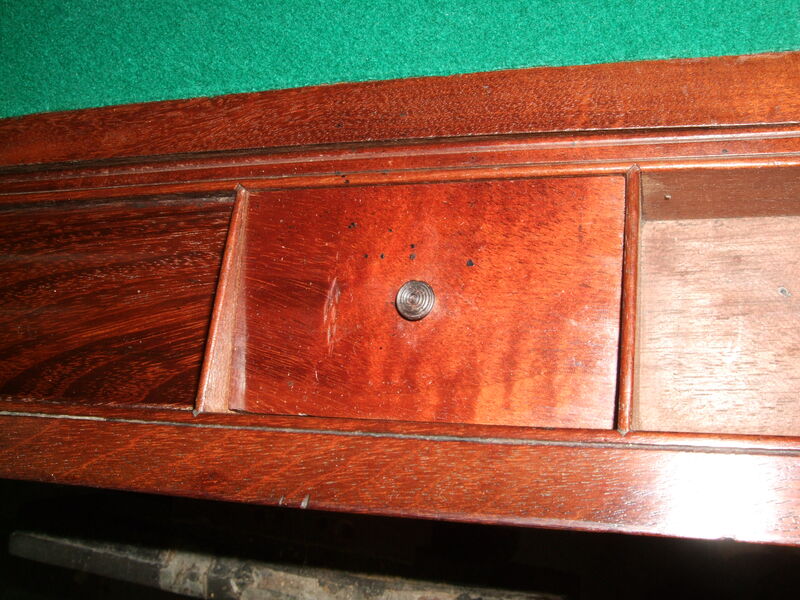 After removal of the baize, the bed was cleaned and the replacement baize was laid, using wallpaper paste as the adhesive. Small pieces of ribbon were inserted into a slit in each writing surface. These enable the surface to be lifted to access the storage compartment underneath. They are held in place by small wedges on the back of the writing surface. A tiny exquisite rosewood knob was turned to match the existing one, which called for extra strong glasses and a very steady hand! 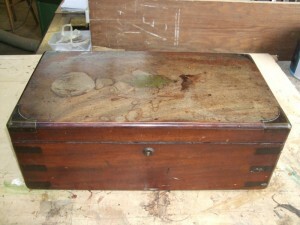 On the outside of the box, the top had to be stripped to allow the marks to be bleached. It was then re-coloured and patinated to match the rest of the box, and re-polished. Special care was taken to preserve the old patination of the brass. . The back was coloured and polished. 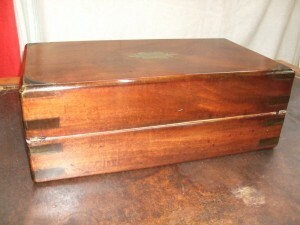 The remainder of the box was not re-polished but the existing polish was revived. Finally it was given a wax polish and an old Georgian key was found in our collection of old keys. The key fitted, so it didn’t even need re-cutting.